Register Log In ECN Forum Forums Photos for General Discussion How did that 'Tap Rule' go again? We all know that you have to bond a service to the water pipes, but somehow I doubt the NEC had this one in mind! Maybe it's a way to drain the excess electrons out? Seriously, the spigot was apparently mounted on the side of the meter pan after the pan and the attached service was abandoned, and the attached water pipe was run into the building through the old conduit hole behind the meter. I sure did a double take when I saw this one! The service conduit, weatherhead, and wires are still in place, just dangling disconnected at the street end. How else is the power suppose to flow freely, if there is no spigot connected? who says we don't get along with the plumbers? Would that there be some of that "Yankee ingenuity"? I've got a "Lame Californian" Q.
I see the padlockable closure at the bottom of this can. Are these things openable?? All of our meter bases are mounted to the back of the box. The cover is held on by a screw in the center of the meter area. One has to remove the meter to take the cover off. Our resi services come with meter, main, and branch c/b's in one enclosure and are called "combination services". 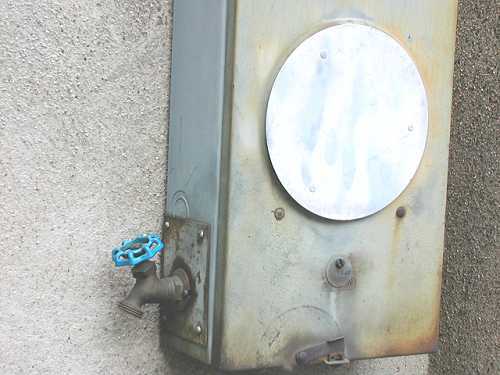 This shot adds a completely new depth and meaning to the term "combination service"
The type of meter socket shown is widely used throughout the MidWest, Upper MidWest States, in my experience. The PoCo usually puts a little wire and plastic non-reversible seal through the eye of the . . . well, hasp, or whatever the pivoting swing-down piece is called. This works to keep honest people out, you know, like door locks. If a service develops a history of problems (pirated power, non payment, etc.) , the PoCo bolts on massive proprietary locking boots that make the cover all but unremovable without their assistance.